Excel WORKDAY function can be used when you want to get the date after a given number of working days. For example, if I start a project today and it will take 20 working days to complete it, then I can use the WORKDAY function to get the completion date. This function is best suited when you want to calculate the invoice due date, project due date, delivery date, etc. This function, by default, takes Saturday and Sunday as the weekend. If you would like to use days other than Saturday and Sunday as the weekend, use Excel WORKDAY.INTL function. It returns the serial number of the date that is after or before the specified number of working days (from the specified start date). days – the total number of working days. These exclude weekend (Saturday and Sunday). You can use a positive or a negative value here. A positive value calculates the date which is after the start date, and negative value calculates the date before the start date. [holidays] – (Optional) It is a range of dates that are excluded from the calculations. For example, these could be national/public holidays. It could be a reference to a range of cells that contains the dates, or could be an array of serial numbers that represent the dates. Saturday and Sunday are considered as the weekend and are not counted. In case the weekends are days other than Saturday and Sunday, use WORKDAYS.INTL function. A date stored as text. A date entered as text (in double quotes). Here are the examples of using the Excel Workday function. 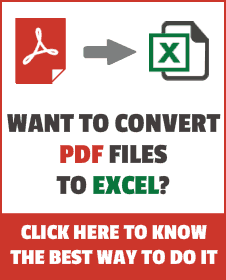 Excel Workday function would return the completion date when you specify the start date and the number of working day. It automatically excludes Saturday and Sunday as weekend (non-working days). In the above example, the start date is 28 Feb 2016, and the result is 15 July 2016, which is after 100 working days (excluding Saturdays and Sundays). 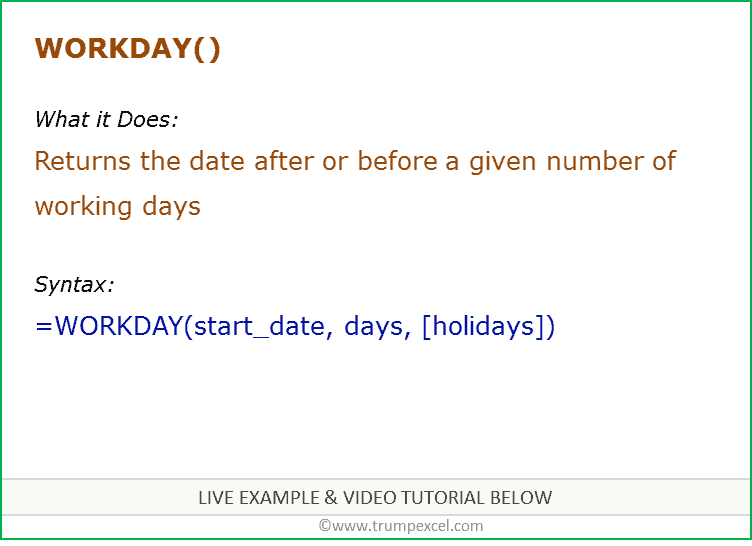 If you want to exclude holidays while calculating the completion date, there is a third argument in the Workday function that lets you specify a list of holidays. In the above example, the start date is 28 Feb 2016, and the result is 20 July 2016, which is after 100 working days. The calculation excludes weekends (Saturdays and Sundays) and the specified holidays in C3:C5. In case, a holiday occurs on a weekend, it is counted only once. Count the number of workdays between two dates.